This blog topic is not for the faint of heart, but then again, neither is motherhood, so if you’re willing to stick it out, keep reading….Let me ask you, is there a more dreaded rite of passage for motherhood than the stomach bug? Becoming a mom means you’re now responsible for sick children, but that’s not the bad part, is it? The cleanup, the late nights, seeing the fear and confusion in your children’s faces, that’s something that breaks your heart, but you expect it and you can handle it. You are glad to be a comfort to your sick child. No, the worst fear is trying to imagine how you’re going to take care of your child, or children, while you’re sick as a dog. Right? I came face to face with that one this week, sitting on my bathroom floor, waiting to be put me out of my misery. All I could think about was that scene from the movie Divine Secrets of the Ya-Ya Sisterhood when Ashley Judd loses her mind when all her children are sick at one time. Hard to blame her character, isn’t it? My Wade feeling better and keeping Mommy company while I was ailing. 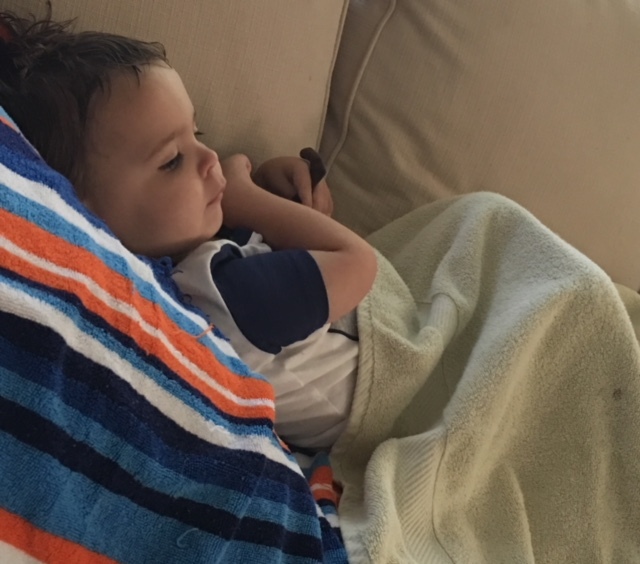 My 2-year-old son had been sick five days earlier with his first real bout with the stomach bug, and I was proud to have been there for him, comforted him and nursed him to bed after a long, sad, afternoon. I’d been too busy worrying about him to be worried about myself, much less after four or five days had passed. Then one morning, maybe 30 minutes after my husband walked out the door for work, I realized I was in trouble. I was running back and forth to the bathroom just trying to get breakfast for the boys on the table. Our part-time nanny was on her way, but she had elected to stay home the morning after Wade got sick – again, can you blame her? When she got to my house and took one look at me, she agreed to stay. I could not have been more grateful. Steel magnolias, y’all. Normally we divide and conquer – she’ll handle the twins and I’ll take Wade – but she took charge of all three, playing with Wade while the twins napped, keeping the twins safely away from sick mom and occupying Wade other than the occasional visit to check on mommy. By the time I needed to get up and help put Wade down for his afternoon nap, I was feeling a little better. With a nap coming for all three boys, I gratefully sent our nanny on her way. Maybe 20 or 30 minutes later, I heard one of my twins, Johnny, crying in a way that wasn’t good. I was not surprised to find him sick in his bed. You know the occasional burst of mom superpowers you get that you don’t think you’re capable of? I rode one of those, to get him up, cleaned up, comforted and settled into another room. By the time I was loading his sheets into the washing machine, my husband walked through the back door. He was like “What are you doing up?” When I had told him I was sick that morning, he had texted that he’d try to come home early from work. His timing was perfect. And guess what, I got to crawl back in bed! It was the most amazing thing. I felt too yucky to sleep, but I lay down in that bed and listened to how well my husband handled everything. Our house was calm and quiet for the next 2 ½ hours. He kept Johnny peaceful, and one by one he got the other two boys up from their naps, fed snacks and quietly into some activity. I couldn’t see what was happening, but I imagined he kept Johnny quarantined in the playpen while his twin brother Wes was across the room in the play yard. Wade was probably watching some “Daniel Tiger” on TV or quietly playing with trucks. This went on for 90 minutes. Moms, you know that’s ions. About the time he needed to leave to take care of some things at our old house (our attempt at moving continues), my mom and then my sister showed up – both of whom live nearby. 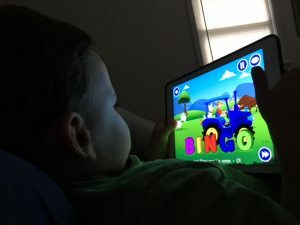 Wade brought his Ipad to bed with me while my mom, my backbone, did all the things that only a mom would think of doing: clearing dishes, wiping counters, putting clean clothes away, and changing laundry, all while keeping the twins quietly entertained. Then at dinner time, not long after I managed to get some food on the table, my sister breezed through the door after work and told me to go lie down. She fed the boys the rest of their dinner and gave Wade a bath. All I had to do was put the finishing touches on bedtime. My day, all things considered, had been an absolute breeze. How lucky am I to have such an incredible group of people around me? One of my big fears had played out, and all it had done was strengthen the bond I have with my family, and my nanny, even more. Wade had given me my first unsolicited “I love you” snuggling up to me the morning after he’d been sick. And then when I was the one in bed nursing the bug, he brought me his favorite monkey Wubanub and the book I love to read to him, “Wherever You Are My Love Will Find You” by Nancy Tillman. Oh my mama heart, as a friend of mine says. I’d follow this guy anywhere. 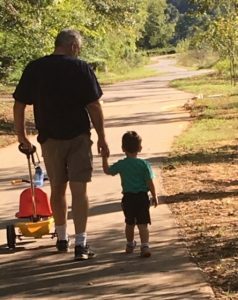 Watching my husband Gus – and the broad shoulders I’m lucky to lean on -and son Wade walking along the greenway. I’m not saying I want to romanticize the dang stomach bug. That’s ridiculous. Everybody is just grateful when one of those has done its ugly work and moved on. So far my nanny, husband and mom have avoided the bug; my sister didn’t. Her graciousness got her sick, right before she was supposed to go out of town for a wedding. Ugh. Unlike Ashley Judd, I didn’t have to get through one of my big fears alone, and that makes all the difference in the world.